The project has taken a major step forward with work being focused around General Steam Navigations trailing truck. With 35011 having the only surviving fabricated trailing truck the society has secured the matching fabricated dust covers for the spring beams. 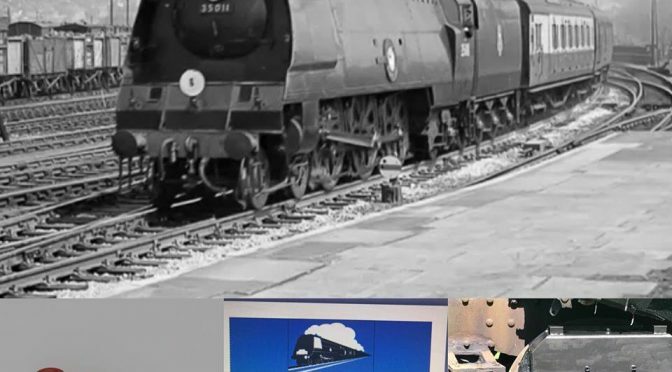 With the drawings for the cast versions not being available the society decided to go with the fabricated design which would improve the uniqueness of the locomotive rather than going down the extremely costly route of borrowing an existing cover, getting that made into a pattern, cast and then machined. The drawings for the fabricated dust covers were converted into a CAD file which enabled the pieces to be laser cut and then welded together. The two dust covers were completed in time to be taken down to the working party over the May bank holiday and were successfully test fitted to the locomotive. Test fitting of the cover at Sellindge. 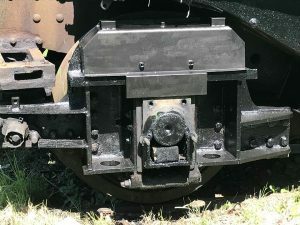 The Society has also ordered of a pair of spring beams for the trailing truck. 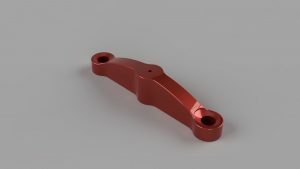 The spring beams are traditionally created by forging the steel into the correct shape and then machining the piece to the required specification however with the introduction of water jet cutting GSNs spring beams will be cut out of a block of steel using and then machined to completion. What this allows us to do is created spring beams that will have the same strength as the forged versions but for around half the price. One of our volunteers, James Pearce, converted the drawings into a CAD file which was sent directly to the water jet company. Water cut beams is a common practice used on recent locomotive restorations although GSN will be the first Bulleid locomotive to feature one and should be delivered during the summer. Once the spring beams are completed we will have all the components required to successfully overhaul the trailing truck once it’s been released during the strip down stage. The only major remaining component will be the hangers for the springs which one of our volunteers has offered to machine and features in the machine shop section. We plan to get all the components together and test fitted on the trailing truck at Sellindge by the end of the year. Issue 7 of the Packet was posted to our members in earlyJune which featured all the latest news from our AGM and updates on the engineering, crank and machine shop fronts. If you’d like to join the society this could be the perfect chance with GSN making excellent progress each and every month. More info on our membership can be found on our website.